At the junction of Front, Green and North Ferry Streets, is the Indian monument which marks the northeastern extremity and blockhouse of Queen's Fort that was built by 1705, after the massacre. 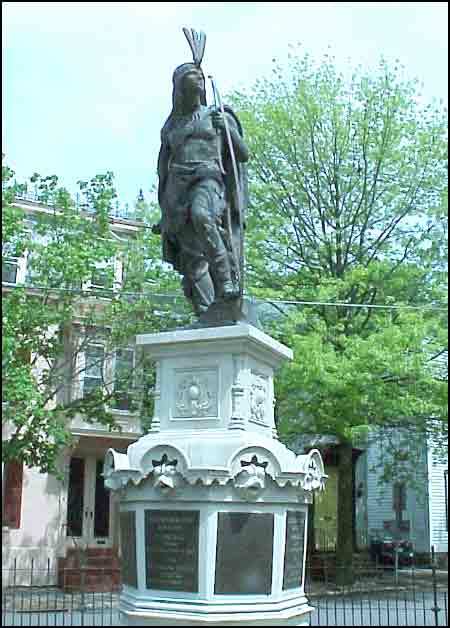 The statue was placed at that site in 1887 and became known as "Lawrence the Indian." Lawrence was named after the Christian Mohawk who was a great friend to the early settlers and the most persistent of the trackers of the retreating French and Indians after the 1690 raid.